Would you use this sink? 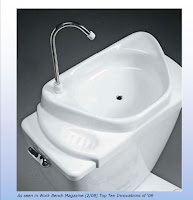 Would you use a sink that rests on the back of your toilet tank? There's something insanely brilliant and yet slightly disgusting about this. Not sure I could feel sanitary washing my hands on one of these, yet I love the idea that the waste water becomes toilet water. So conflicted!